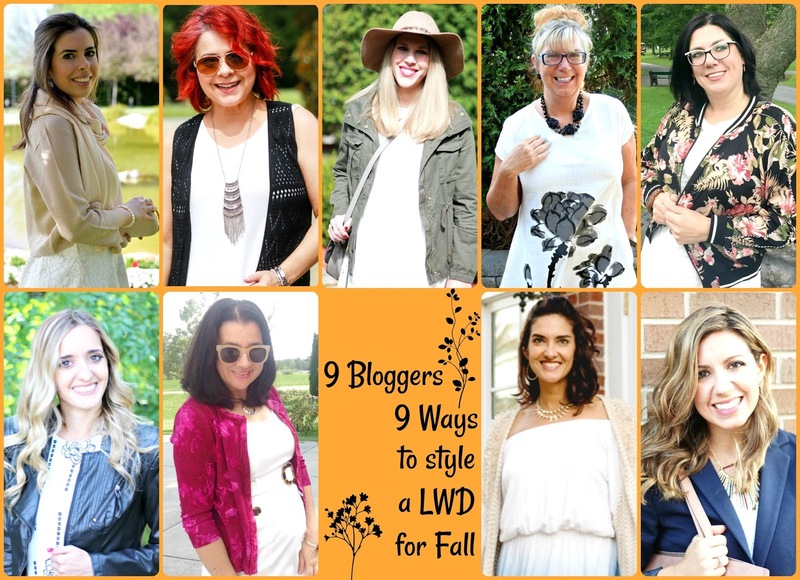 I am excited to be collaborating with several other fabulous bloggers today to show you how to style a white dress for fall. 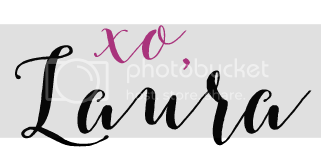 We will be collaborating again on September 26 to show you some fall wedding looks, too. We all blog from different places and lead different lives so there is something for everyone! This white dress is one I've had for a while and is the only white dress that currently fits me. It's got a boho vibe which I love, especially in summer. 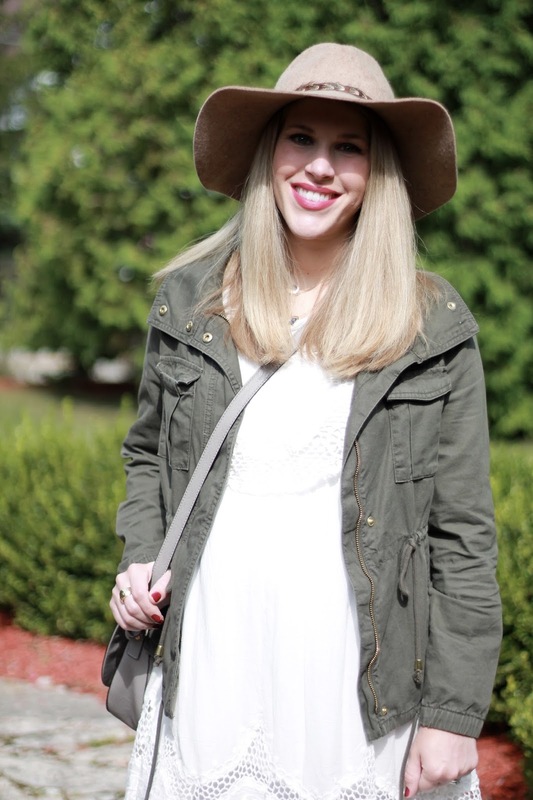 But by adding a pair of taupe booties, olive jacket, and hat it definitely works for fall, too! White is a color I gravitate towards in summer, but don't always think about in fall with all the typical rich fall tones. But it can really lighten up an outfit or help make an outfit more transitional in that late summer/early fall time. How do you wear white in fall? See how these other stylish ladies other have worn their white dresses by visiting their blogs below! Shelbee from Shebee on the Edge blogs from Watertown, New York, USA. What a cool collaboration! The LWD is so perfect anytime now. Love how you made your casual Laura and I love the hat! I love how you made your white dress work for this Laura!! I love this look! Olive is one of my favorite colors for fall and ankle boots are my go to! They say, we're ready for fall, but not quite full boots! And they are so cute to help transition dresses! What a great look! Love the olive jacket over the white dress....good transitional look! What a pretty dress! It totally works for fall too with that jacket and booties. And I love the hat on you too! Love the theme and seeing what all the others wore! 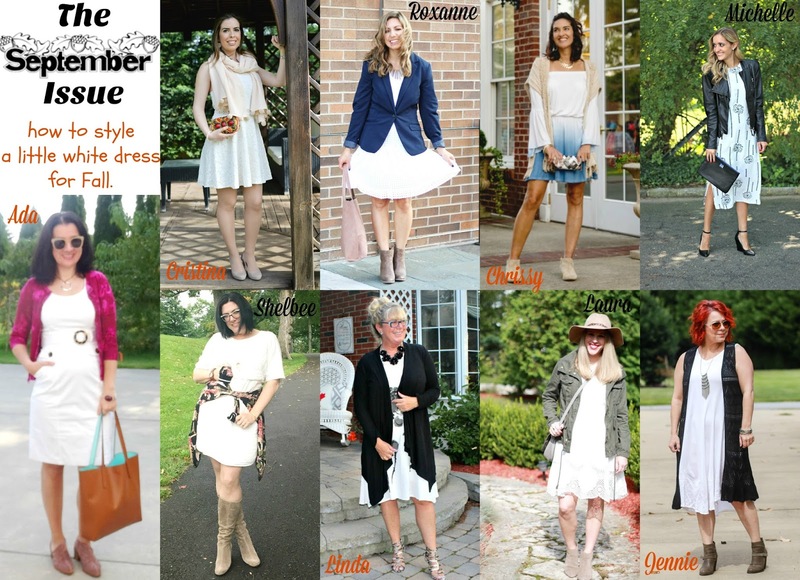 I love how you transitioned your white dress for fall! The detailing on your dress is beautiful, and I love those booties. Such a fun collaboration! Such a great idea! I love your addition of booties, a fall jacket and a hat! I have a white dress, but it is OTS, so not the perfect dress for the fall. That is why I love this collab, it is nice to see different layering options to make it work for the fall! 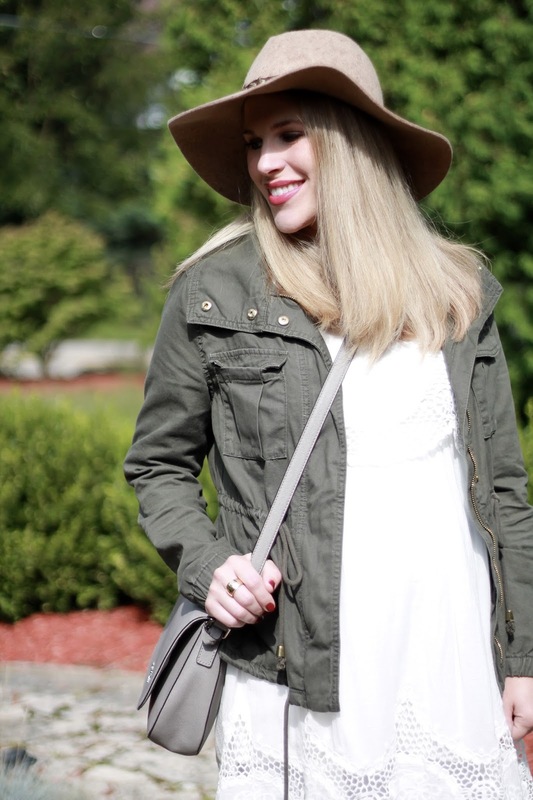 I love the utility jacket and hat you added to your white dress. That baby belly is looking mighty cute, too! i love this idea ! Great style and love the detail of your dress. what a pretty combination with the neutrals. Adding the hat is such a fab idea. I have all the pieces to recreate this outfit and I am TOTALLY going to! This collaboration was so much fun!! Love this post with all the great ideas for wearing white dresses for fall! Since I live in central Florida, where it is summer all year round, we wear white all year round too! Many blessings to you! Laura, it is adorable! 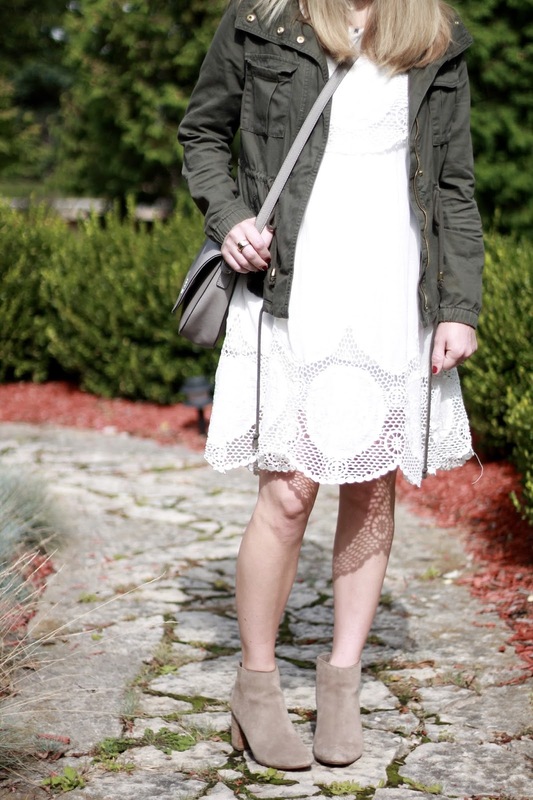 I love the olive jacket and booties paired with a white summer dress! Such a great look. You look so fabulous. This was so much fun. I am looking forward to the wedding guest post in two weeks! Love your booties! I think the white looks perfect for fall! I love how you all styled it so differently. I love seeing all the different looks! Your white dress looks great with the jacket and the booties! I really love how you've made this pretty white dress perfect for fall. I'm so excited for jacket and ankle boot season! 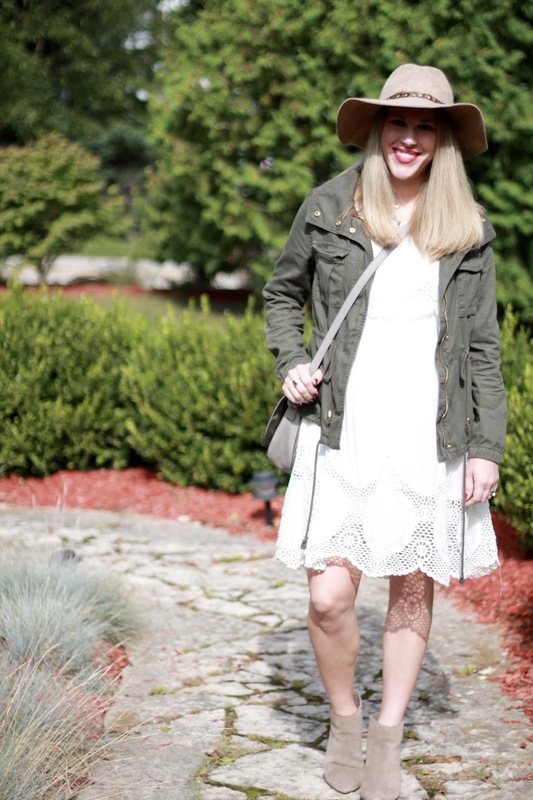 I love how you've styled your white dress with the booties and hat! Thanks for linking up! Cute as a button as always Laura! I love seeing how different everyone is and how they styled a white dress, super collaboration. Just got our power on so I'm a little late today! I love how you styled this. Can I say that one aspect I like about this outfit is I own some similar items and can duplicate. The best ideas are stolen ones, right?! I just remember to give credit where credit is due. ;) Love the hat and it was lovely to "meet" you this week! Laura, you look so beautiful! Perfect styling for transitioning a LWD. Such a fun collaboration! All of these outfits are so chic! I never think about wearing a white dress in fall, but I love all these ideas! Love the details on your dress, it's so cute! The ankle boots are perfect for your jacket too! You all look fabulous in dresses. Your jacket and booties are so pretty.